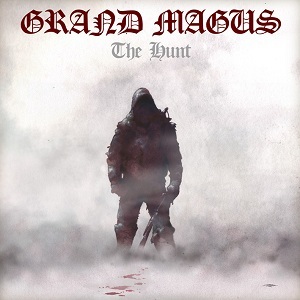 The Hunt is the sixth studio album from Swedish three-piece metal band Grand Magus. This latest album has a real 70s hard rock/heavy metal sound. Rival Sons have shown recently that a 70s sound can be brought up to date and sound fresh and still retain that classic hard rock sound, and now Grand Magus have done the same. Listening to the album you can certainly pick out some of the influences - Deep Purple, Rainbow, Dio, and Judas Priest. Opening track "Starlight slaughter" would feel at home on a Deep Purple or Rainbow album particularly with its chorus. This is a great track and really sets the standard for the rest of the album to try and beat. "The Hunt" has a good heavy guitar riff and good solid drums, and later on includes some nice guitar work - all in all a good strong song. "Valhalla rising" is one of the standout tracks (along with Starlight slaughter) on the album - one of the heaviest songs on the album it has a seriously heavy guitar sound combined with a deceptively simple catchy chorus, this really is a great track. There's plenty of variety in this album and the strongly 70's influenced sound works really well - this is definitely an album I'm going to be listening to a lot. The Hunt will be released on 25th May via Nuclear Blast.